Popular German TV quiz show Schlag den Star is getting its own Switch exclusive outing, which will be distributed by Nintendo of Europe. 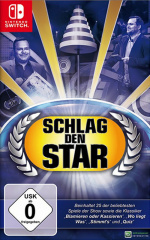 Schlag den Star is massive in Germany, and was adapted for UK television in 2008 as Beat the Star, in case you were wondering. The game - which is being developed by Lost the Game Studios - is built in Unity and features a 3D representation of Elton, the TV show's real-world host. You can can create your own avatar for use in the quiz, and a 4 player multiplayer mode is included. There are 25 different games to take part in with more than 8,000 questions. and some of the included mini-games make use of the Joy-Con motion control. The catch? It's only coming to Germany, Austria and Switzerland. If you're in one of those countries, let us know if you'll be picking this family-friendly exclusive up. I'm Swiss, but this is a pass from me. Schlag den Star is technically not a quiz show. Only a small proportion of the show, maybe 30 percent, revolve around knowledge and answering questions. The other games require skill or are sports adaptions. So I'd assume we should expect a mini-game collection rather than a quiz show. In fact, there were already several adaptions of this show, then called Schlag den Raab, for the Wii. AFAIK they were quite successful, with altogether three installments released. The Wii prequels of the "Schlag den Raab"-series were such a bland and boring representation of a tv game show. This one is probably not much better. Nintendo publishing this must be a mistake. Finally, a quality game for the Switch. Yes I love a schlag den schtar! This isn't shovelware. It's not claiming to be something it's not. It's actually pretty good to have in the Switch's library. It's not meant for gamers, it's meant for people to play once or twice at parties without needing any particular practice. If you miss out on this one, don't worry. It's not worth a cent. These games, there were some for the Wii too, are the definition of shovelware. This made me want a Switch equivalent of Buzz Quiz TV, a really fun quiz game on PS3. I'm actually quite looking forward to seeing some game show games (lol) on Switch. They're shallow, sure, but they can be fun in a crowd. Well, I live in Germany and haven't heard from this show in years. It might still be a "big hit", but I'm just not watching regular TV anymore. I thought for a second that that was Jim Sterling on the cover photo. But then again it couldn't be, as Jim's never happy. i might get this jsut to touch up on my german. @Jamotello "i might get this jsut to touch up on my german." You need to master English first. There's 3 mistakes in that above sentence alone. @MegaTen I bought Wheel of Fortune for the Wii, just to see Pat Sajak in Mii form. @Paperboy I liked the Buzz! games as well on PS2. The pop quiz one was my favourite. @SLIGEACH_EIRE i saw 11. left them in. It's no Cheggers' Party Quiz. Schlag den Star is not a quiz show, but a game show. There are many many different games being played there and just some of those games are quizes. Wow...Xbox DO get the best exclusives! Sorry for doubting you Phil. I guess there won't be an English option? Now that is what you buy a Switch for. There is a big mistake here! According to the game's listing on Nintendo's German website, Schlag den Star - Das Spiel is published by bitComposer Games, not Nintendo of Europe!